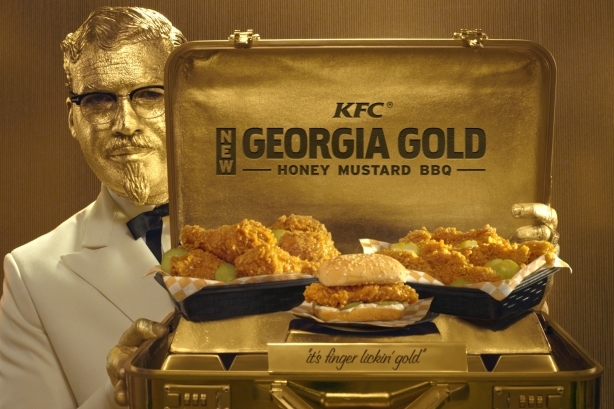 The Georgia Gold Colonel, played by actor Billy Zane, is part of a marketing campaign for KFC's latest product: Georgia Gold Honey Mustard BBQ Chicken. NEW YORK: KFC continues rotating its Colonels and has unveiled its seventh since 2015: the Georgia Gold Colonel, played by actor Billy Zane. The new gold Colonel is part of a marketing campaign for KFC’s latest product, Georgia Gold Honey Mustard BBQ Chicken, which will be available for a limited time starting January 30. Zane is known for his roles as tycoon Cal Hockley in Titanic and most recently as Stan Gutterie on ABC’s Guilt. 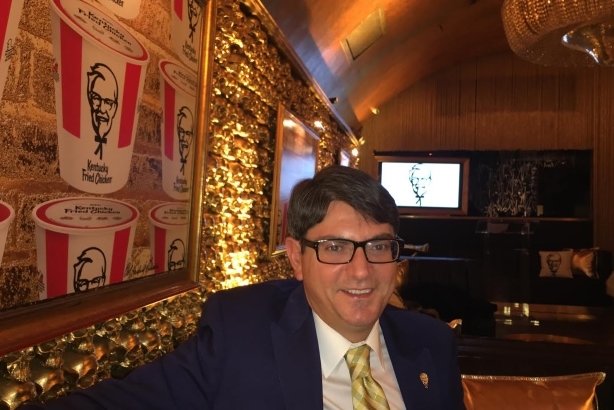 As the Georgia Gold Colonel, he is sending out the message that "you don’t have to be a millionaire to eat like one." "Our first goal is creating awareness that we have this new recipe and [communicating] what it tastes like," said Kevin Hochman, KFC U.S. CMO. "There is a 12-week promotional window, lasting until April." For the big unveil of the gold Colonel, KFC is focused on media relations and held a press event in New York on January 25. That night, the first ad with the new Colonel was also released. During Super Bowl week, the brand will launch five pieces of content with Zane around the product, Hochman said. He could not disclose further details. "We want to build content around an ad," he said. "People watch a 15-second ad and say, ‘What else is there for me to consume?’ and if you don’t have anything, that is where your relationship is going to end." KFC first seeded Georgia Gold Honey Mustard BBQ Chicken during the Golden Globes when it sponsored the Harvey Weinstein after party. That resulted in actor Marlon Wayans organically tweeting out a picture of Cuba Gooding Jr. wearing a KFC bucket as a hat. The picture was heavily covered by media outlets, including People and Vogue. Stephen Colbert also brought the picture up when Gooding was a guest on his show earlier this month. "A lot of people have seen news about our turnaround and they say, ‘Should I really go into a KFC?’ Then they see a celebrity eating it and they want to try it again," Hochman said. Earned impressions such as this are making an impact on KFC’s brand, but Hochman added that sometimes it’s hard to quantify. "Young people are having improved growth and consideration [for the brand] and they don’t watch TV, so that data makes us think this stuff is contributing to it," he said. For example, a YouGov tracker comparing September 1, 2015, to September 1, 2016, showed KFC brand consideration among 18- to 24-year-olds went from 18% to 26%. Hochman noted that the brand needs to change and reinvent its rotating Colonel strategy in order to keep the concept fresh and interesting and reflect what people want and value. "It’s clear that if you want to get the buzz and impressions, you can’t just do the same thing every time," he said. "The gold Colonel will create another whole slug of news and excitement because it doesn’t look like any of the other Colonels we have." A female or African-American Colonel might be on the cards. "I would be saddened if I leave this role and we don’t do things like that," Hochman said. In terms of future plans, Hochman said KFC is putting "millions of dollars" into using tech to tell the brand’s food story — that is, that KFC serves fresh hand-prepared chicken from U.S. farms. He could not disclose further details. KFC underwent a "re-Colonelization" last year, reintroducing its employees to the cooking standards and philosophies Colonel Sanders put in place when the restaurant’s first franchise opened in 1952. The company has committed to remodeling 3,000 restaurants in the next three years. It also backed an extensive ad campaign featuring different celebrities playing Colonel Sanders to bring back the mascot and his values in a "fun and contemporary" way. Edelman has been working with the brand since last January, when it ended its relationship with Emanate, which had served as KFC’s consumer and corporate PR AOR in the U.S. since 2012.